Comments: Like Clark’s Grebes, Western Grebes are large-bodied and have long necks. However, their black caps extend below the eyes and their bills are yellow-green in color. 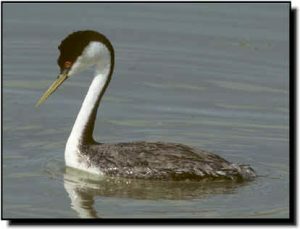 Although they occasionally hybridize with Clark’s Grebes, the two species differ in behavior, calls and use of micro-habitats. Both species breed on large fresh and brackish bodies of water, but Western Grebes tend to forage in areas with shallower water. Western Grebes are more numerous and have a wider distribution within the Great Plains. They winter along the Pacific and Gulf coasts. Their larger size distinguishes them from Horned, Eared, Red-necked and Pied-billed grebes.